Made By Some Pretty Amazing Women In Swaziland, Africa. Timbali Crafts is an income generating project for women in Swaziland, Africa. In this tiny nation with the world’s highest HIV/AIDS rate and the lowest life expectancy, the needs are immense. The 100 women who create Timbali Crafts are all volunteer cooks at feeding centers for orphans and vulnerable children. In their rural communities of Engculwini and Nsoko they help to feed more than 2500 children daily. The women themselves face many hardships: most are either widowed or abandoned, many are single mothers, or grandmothers raising their orphaned grandchildren. Timbali Crafts was started in 2006 to help reach out to the physical and spiritual needs of these hard-working women and their families who would otherwise have little or none. preparation for school fees due each January. a loved one, or have a special need, and also medical care when needed. hardworking women and that it will be a tangible demonstration of His love. A care point is a community based feeding center for orphans and vulnerable children. opportunities, and AIM Swazi staff does regular discipleship lessons with the children. 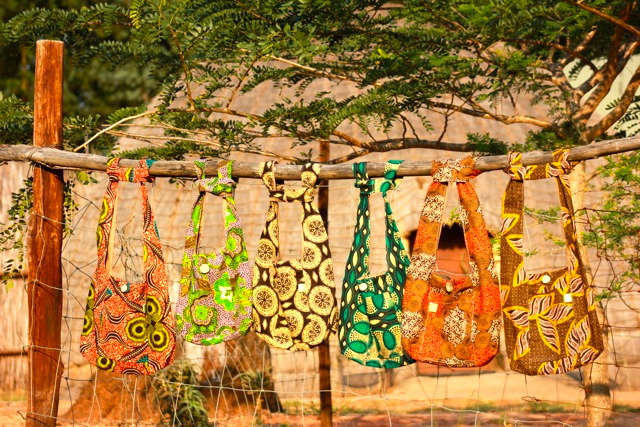 Each Timbali product is created with a unique combination of African fabrics. Every item is different. Each Timbali product comes with a tag signed by the woman who created it. Take a look at our unique products, each made with a beautiful combination of African fabrics.